Russia Finally Launches Supplies To ISS After Earlier Failures : The Two-Way The liftoff of the Soyuz Progress 60P was a relief to astronauts and cosmonauts aboard the International Space Station after two previous resupply missions — one Russian and one American — failed. 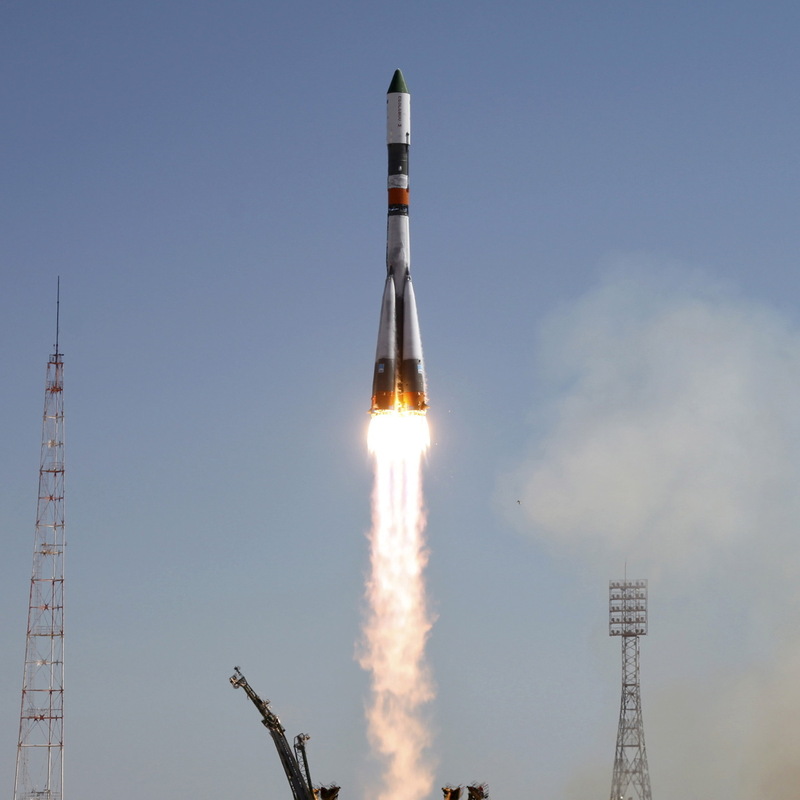 A Russian Progress spacecraft blasts off from the launch pad at the Baikonur cosmodrome, Kazakhstan, on Friday. A Russian rocket filled with much-needed supplies for the International Space Station lifted off from a pad in Kazakhstan early today after two previous re-supply missions failed. NPR's Corey Flintoff reports that the successful launch of the Russian Soyuz spacecraft, known as the Progress 60P, which is set to dock with the station on Sunday, was a relief to the astronauts and cosmonauts on the space station. In April, a Russian supply ship veered off course and eventually crashed back to Earth. And, last Sunday, a SpaceX mission broke apart after launch from Cape Canaveral, Fla.
Corey reports: "Today's successful Russian launch will provide the space station crew with nearly two and a half tons of oxygen, water, food and fuel." As NPR's Geoff Brumfiel reported earlier, the situation on the ISS was "still far from a crisis," as the astronauts aboard had enough supplies to last until October "and they have a spacecraft docked to the station that could take them home, should they need to leave."